Shopping with kids is bad. Very bad. Today I took the kids with me to a few stores. 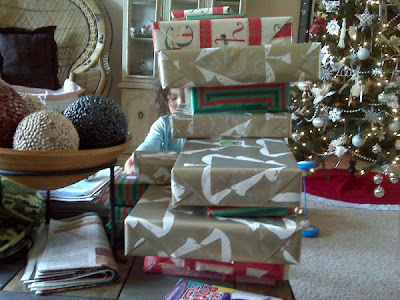 I had in mind when I left the house to actually buy the last few Christmas presents that were on my list. 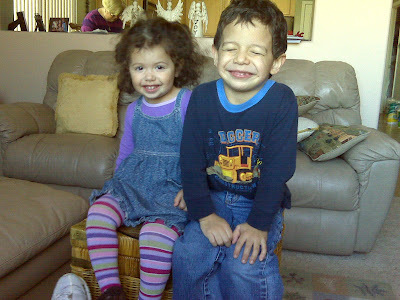 Eddie and Alexa had on their minds to play and laugh and have fun. I first went to Bed, Bath and Beyond. It was in this store that I realized that there are just way too many breakable items within reach of small hands. Small hands that are attached to small children who are too young to grasp the concept of the words shattered, shards, or "QUIT BEFORE THEY THROW US OUT OF THE STORE!" I don't think I've ever paid attention to just how many things in this store are breakable before. Until my children got there, and started knocking things down. We left without buying anything. It was for the best. We went to JCPenney next. In this lovely store, I only found one item to buy. I was actually quite busy moderating a fight over the one seated store stroller that Eddie and Alexa both thought that they needed to sit in. Mind you, when I bring my own double stroller, or single stroller for that matter, neither one of them want to sit in it. I end up pushing around a big bulky empty stroller through the store navigating through the small aisles and clothes racks as the kids walk by my side. So I didn't bring it. And instead, they fought. The entire time I was in the store, I was the lady with the screaming children. I made them take turns. While the kid sitting in the stroller was enjoying his or her ride, the other stood on the wheel. Which made it very difficult for me to actually push. Then the standing child would smack the sitting child, because that's just the appropriate thing to do. And then either one of them would scream. Because they were jealous, or the other one was bothering them. *sigh* I paid for my one item and left. We then tried our hand at Target. My kids love that HUGE big red buggy that two kids can climb into the back of, and stand in or sit down. My son thinks it's his big pirate ship. Or so he claims. I told him that if he climbed on top of it again, that I would have to abandon it and we would just walk. Well he did it again. And this time he was OK with it. It was Alexa who fell apart. She screamed like I had just ran over her foot. She was so mad at me for leaving the buggy there, she almost laid down on the ground. I told her that she could stay right there with the buggy if she wanted, but I was leaving. She screamed for another 5 minutes on and off, but she eventually got over it. 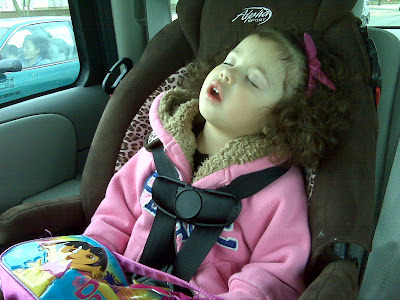 I think it must have been nap time, because she got cranky again pretty soon after the buggy incident. I'm not sure what I went in the store to buy, as my concentration was wrecked with my little angels and their perfect behavior. I think I am going to have to plan just one more trip. No kids. I have no idea how I get anything done with these kids. Shopping and kids just doesn't mix. Ever. Can we talk about gas? Really? Can we? The problem is my son. If you could call it a problem at all. I mean, he is 3 and a half years old. And he has discovered the wondrous bodily function of passing gas. He does it ALL the time. He laughs and laughs and then when you think he us incapable of more, he does it again. Passing gas is turning into a favorite past time. We call it, "tooters" in my house. And he can tooter all day long. On an unrelated note, we went to a birthday party today. 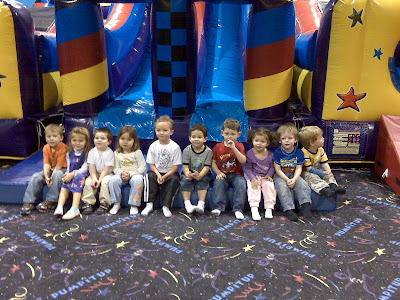 It was held at a place called Pump It Up. 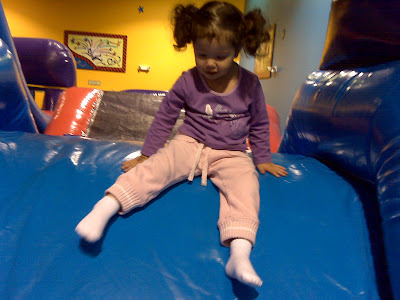 It's an inflatable indoor play area that has obstacle courses, giant slides, and bounce houses. 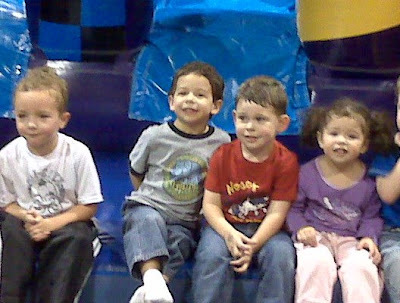 We had Eddie's 3rd birthday party there, and the mom of a little boy that we invited to our party liked it so much that she decided to have her son's party there too. The kids had a lot of fun, and even let me sit back and watch rather than insisting that I climb all over the place with them. I think about what I am going to do today. Oh yeah, blog. You see, I have missed my bloggy friends so it's only realistic that I do in fact show up every once in a while to say hello. And then my friend Spoiled Mommy over there is hosting "Favorite/Not so Favorite Friday" and I thought that I would play along. Today. My favorite NOT FAVORITE AT ALL. No they are, not. No really, they are. (Sssshhhh.) Don't tell my mother. She just bought a new bag. 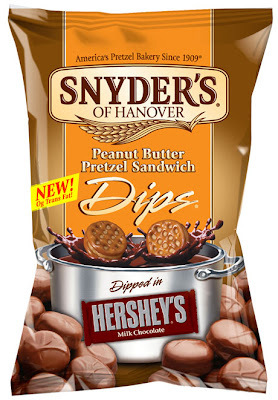 They are Snyders peanut butter pretzel sandwiches dipped in Hershey's chocolate. OMG. Really. The bag that she just bought last night is empty. The things are pure evil. I couldn't stop eating them. But in my defense, my mother had a handful. And my brother ate one two. He just informed me that two were stuck together. And Alexa ate one. So I really and truly did not eat the whole bag. But my goodness. Pure evil. That's all I'm gonna say about that. As for my not so favorite thing. I would have to say owning a home in 2007 when you are a military family holding orders to leave the country. Holding orders which state that you are to move to another location. While the government is working so hard to BAIL out people that I feel do NOT need to be bailed out, why not give our military folks a hand? The ones that work so hard to protect this country, why not give them a hand when they truly need it? Because of the housing crisis, our home is no longer worth what we owe on it. So much like a bad car loan, we are now upside down in our mortgage. Though we have faithfully paid our monthly obligations, we are at this time facing a bit of a hardship. We couldn't sell our home in 2007 when we tried for a year. So we rented it. Our first renter bailed out when he lost his job. Our second renter didn't even make it past one month. Our home now sits vacant. And it's Christmas time. So this military family stationed in Chile still has to meet and pay for a home that we no longer live in. 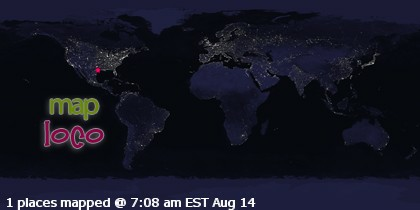 And there is nobody out there willing to give us a hand. The government is not meeting to discuss our bailout. We pay, and we pray that we find a new renter. A good one, and stable. To pay the rent on time, so that we don't have to worry about foreclosure too. So here are a few pictures snapped from the phone. A moment in time from my life. From here and from there. 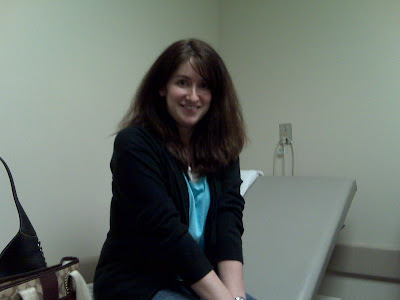 I spent several hours in the ER two nights ago. My dad took a fall. It was urged, by me that he go. I'm grateful that he listened. No bones were broken, just some bruised ribs. Driving around town. 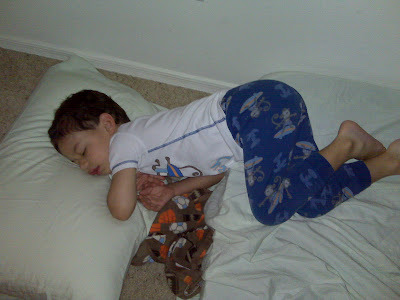 My sweet baby sleeps. 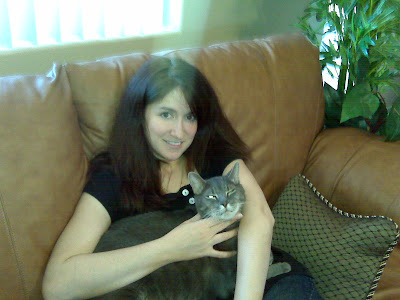 Corona and his mommy. Reunited once again. OK, now these next 3 were not taken by the phone. But it is a cool find. I'm somewhat known for coming across bargains. One could say that my eyes are always opened. It's the true shopper in me, I never stop shopping. Well, the other day I was looking on craigslist, and I came across an ad. An ad for a playhouse. A very large playhouse. Used. But no matter. I almost thought that it was a mistake that the person who placed the ad had it listed so cheap. Any name brand playhouse can bring in a nice chunk of change. Even used. I looked at my watch. It was only 15 minutes after the ad was initially placed. I sent an email. The person didn't respond until 8 o'clock the next morning. Later on that day I became the proud owner of a Step 2 playhouse for my kids. And I got it for the bargain basement price of just $45.00. Yes, it's true. I got a major deal on that. The house is gigantic. It had to be towed in my brother's flat bed trailer. I couldn't even believe it. Brand new that same house can be bought for a mere $499. The kids absolutely love it. And I couldn't be happier about it too. Just hanging out at the house. Any time Dillard's has a sale they call my mom to let her know. She's a triple platinum card carrying member of the American Express Dillard's elite club. She loves Dillards. I used to work at Dillards. I like them pretty much too. But they don't call me. I have to hear about the sales like every one else. They usually put an ad in the paper. So today we went off to the mall. I wanted the kids to see Santa. And really hoped that they wouldn't be too scared to see him. Eddie protested a little bit. But I think Alexa's enthusiasm to get to the front of the line calmed him down a bit and the fact that Santa wasn't eating the children as snacks, was a bit warming to him as well. I was pleased that they didn't cry (like she did last year) and that at least I got a somewhat decent picture. Which I will not post, because I don't have a scanner here where I am. I did however manage to take a shot with my phone, so here it is. When we finally made our way around to Dillards, there was a nice lady who stopped to talk to my children. She asked them if they saw Santa. They immediately began chattering to her. 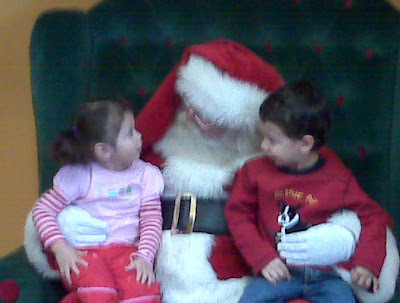 She had asked my daughter what she told Santa that she wanted for Christmas. And miss Alexa looked at her and told her, "I wann uh gun. But ah need twoo guns." And then Mr. Eddie chimed right in and told the woman, "But I already have a gun right now." The lady looked a bit surprised, as was I, and she said that she hoped that they were pretend guns. I nodded and yanked my children right out of there and walked away. Quickly. Ok. So we shopped very little. We saw Santa, and then we played in the play area that most malls now have centrally located by the food courts. It was here, today, that I found out exactly how aggressive my little girl is becoming. I saw her push a bigger boy. Why? Because he was a little too close? I would gather. She didn't say anything to him, she just kind of pushed him. And there was another boy there too, she started pointing at him, and it didn't look at all friendly. I called her name to divert her attention. She came over to me for a moment and then went back to play. I watched her run around and climb on the toys. I watched Eddie too, running, jumping, happy. I saw Alexa climb on top of a turtle's head and sit there. There were two little girls near her, talking to her, but not looking happy. It looked as if they wanted to push her off the turtle's head. I got up to join her. The girls were not her size. In fact, they were quite a bit bigger. Like maybe 6, or 7 at least. When I went over there the girls began to talk to me. They told me that my daughter was telling them to go away, and that they couldn't play there. Because it was all hers. And she kept telling them to leave. I had to smile, but I was really surprised to hear this. My baby girl was telling these big kids this. I smiled at the girls and told them that they are fine, and to ignore her. I told them that she is only two and she doesn't understand how to share very well. I took Alexa down and started to take her out of the play area. She promptly dropped to the ground where she started screaming bloody murder. I walked away and when she realized that she didn't get the attention that her efforts deserved, she quickly followed. I had to take both of my kids out of the play area because my two year old is being a bully. Nice. 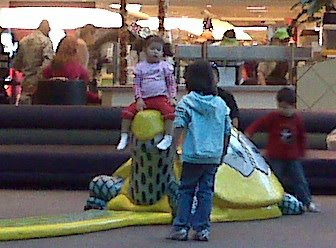 The girl in the picture in front of Alexa sitting on the turtle is one of the two that she was telling to get out of her play area. I've been to Target a half a dozen times already. It never gets old. The bright and shiny lights, the hustle and bustle of people parading through the doors, and up and down the aisles feel welcoming to me. The people chattering in English, ah... glorious English. I feel like I belong here. I've been to The Wing Stop, Los Nopales (Mexican restaurant), Papa Murphy's (pizza), I've been to the base (Davis Monthan Air Force Base) to walk around with my parents. It's nice. It feels good. I remember all the times I was there before when I would call my dh and he would (or really was spared a few short moments) to come and join me for lunch in the food court. It felt safe. I have enjoyed seeing the neighborhood homes as they all start to put up their displays of Christmas decor one by one. I have driven through the city that once was foreign to me nearly 4 years ago, and thought of the memories that this place holds for me. I've been to my house and walked through the vacant rooms. This place feels the most special of them all. I brought both of my babies home to that house. And as I walked through and inspected the state of the home, it was hard to imagine the callousness and ill regard that people have for other people's property. Though it could have been much worse, it was in fact still standing. And nothing was taken or damaged. It just looked a little sad. They didn't take good care of it. I guess that is the best way to explain it. I can't imagine leaving this place again. I can't imagine not being here. I don't want to. But there is a big part of my life that is not here. It's missing. And I can't reconcile the two. No matter how much I try, they just don't add up. I don't want to go back there. And he can't come here. Not right now anyway. And not for good, not yet. So I think right now I just wait. I have some things I have to accomplish while I am here. Some very important things. I am thankful though, that at least I get to see my dh in less than two weeks when he flies in to be with us for the holidays. It will be his birthday when he arrives. I am planning to take him out to dinner. I want to go to Outback Steakhouse. But I think he might want Chinese food. He adores it. Since it's his birthday, I think it's only fitting that he decide. Oh and we aren't taking the kids. Bonus. So this Christmas, I don't really want anything at all. I have everything that I need. I am healthy. I am loved and I have a beautiful family. That's more than a lot of people can say. So while all the material things are nice, I am just very very fortunate to have all that I do. If I had to ask for anything at all, I would ask to have my family all together, for good, in America. I've never felt so strongly about this place as I do right now. I think I have a better appreciation for it. Not much time to blog. Though I've thought of my happy little blog a lot, I just haven't been able to make the time to create new posts. I've been running around to different places with my family. I've been going there, and here and everywhere. My kids are pretty excited about the holidays, and are enjoying every bit of the Christmas displays that we have seen. 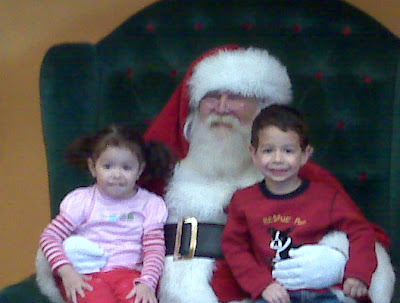 I am planning on taking them to see Santa some time in the near future. In other news, my husband has just booked a flight to come here too for the holidays. He will be spending Christmas with his family after all. We are all very happy about this news. And to top it off, the government paid for the majority of the tickets. I am thankful. I hope that I can find some time to post, but I just wanted to give a little update as to what's going on with me. We are busy, we are with family and having a good time. Whatever, I'm late. But it's still Monday. A lovely friend of mine had to remind me what day it is. Duh. I think I may be having too much fun shopping. I was not paying attention. Sorry bloggy readers. But, I want you to know that I am still hosting my weekly video thing. Anyway, I really like the idea of random videos. Then there is less pressure to record something new. Well here is my random video for today. Eddie and Alexa were having a little fun on the merry go round outside of the BX (Base exchange). Once again, to play along just post a video of your choice on your blog and take a button. Link up to me here. And have fun. I'll try to think of a theme for next week. And I will also try to be around more this week. I've been enjoying the family and kids are running around having a blast!